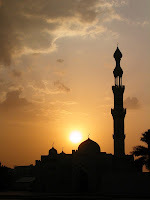 The holy month of Ramadan (Ramzan) is to arrive to us in just a week or so. According to Southern California’s Surah Council its gonna start on 13th September this year 2007 in this part of the world (US west coast). No doubt this month will be observed as always, with much respect and religious observances by faithfuls across the globe. This particular month is singled out and portrayed the most blessed month in terms of spiritual benefit through different actions and worship in Islamic faith probably than any other time in any other religion including other Abrahamic faiths. But how can we achieve the essence of fasting and how can we not limit to it to mere abstinence from food, drink and sexual engagements - is something different. Before going into - its worth remembering one warning regarding ritualistic fasting void of connection to sincere heart. God definitely doesn’t want our empty, “go with the crowd styled” abstinence from food or drink while we are constantly unaware of the need to purify ourselves. Here is a simple but practical way to prepare mindset and practice for the Ramadan based on the symbology of fasting and sacrifice. Be a witness to your self, to you nafs or lower self because that’s where most of us abide by.Witness it because you will be made to witness it tomorrow or sometime sooner than you can imagine once death comes to you in a snap! Witness it, point out own weaknesses. Stop seeing the weaknesses of others (which is so easy, isn’t it!) but look at yourself carefully. And you are so right! We have so many weakness all imbued in us. But don’t be over whelmed when you see scores of weakness, negativity, shadow. No need to feel depressed or shameful but remember that God is the Most Merciful and God confirms that He created human being weak. Like a loving Mother the Creator knows our weakness, faults and He is all the time ready to forgive us and call us back to Him (just as a mother does, imagine that Millions times and then stretch to Infinite – that’s how Compassionate God is!! Allah, Rahman, Allah Rahim!). Out of those scores of weakness take out the one that bothers you or disturbs your higher self most. You don’t even need to ask other, ask yourself – you already know. Or will know. Ask and it will be answered, is an ancient ancient promise, yet so true! Concentrate on that singled out weakness. It could be lack of patience, weak mental strength such as unable to avoid lies, vain talking, controlling your lust, bad anger or any other ten thousand things. You figure it out! While you fast in this month long fasting, fast on that negative aspect as well. Fast with the pure and strong intention. Just as you are turning away from food and drink, turn away from that particular weakness residing inside of you like a shadow. Be vigilant, constantly witness yourself and check your nafs (tendency of your ego) from going into that attitude or behavior. Use the symbology of abstaining from food, water and when you feel hungry or thirsty how you remind yourself that you are fasting. Exactly same way remind yourself that you are fasting on that particular shadow and you are not going there! May the shadow (the absence of the divine attribute) be replaced with light, with one of the divine attributes of God. End of the Ramadan, just as the sacrifice is done in remembrance of great Prophet Abraham’s sacrifice according to the Command of God – sacrifice that particular shadow in-sync. Allahu Akbar. God is greatest beyond our perception of beyond. Exactly! God doesn’t need the blood and flesh of the sacrificed animal, but He looks for the pure heart’s sincere righteousness – in that very symbol may you offer a pure heart devoid of the shadow and may after sacrifice you offer back God a pure heart. continue reading the verse 22:37 of Quran mentioned above,… thus has He made them subservient to you, that you may magnify God because He has guided you aright and give good news to those who do good. The shadow of the ego is made subservient to us, just as the animals are made subservient to mankind. The ego (lower self, nafs) with all possibilities, can be over-powered and the shadow is made only to be replaced by light again. All human being is gifted with the capability to overcome inner shadow, be full of Light and thus return to His image. no copyright reserved. please feel free to share or inspire others, with or without giving credit to this blog or the poor author. Allah Malik, God is the Real Inheritor.